Studio Henny van Nistelrooy : Installations : UCCA "Charging Station"
For the forth Art Basel Hong Kong, we designed the booth for UCCA with the theme of “Charging Station”. The design follows the UCCA black, red and white colors and includes a special edition of Mazha. We created hybrid furniture that connects a book display with a reading table. 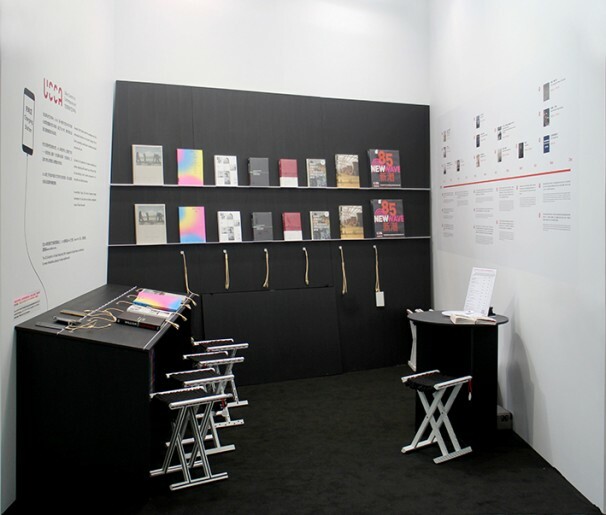 Here visitors could browse through UCCA catalogues while charging mobile devices. The furniture was painted matt black so the catalogues and Mazha stood out. The book display and phone holder were made in gloss white acrylic as a graphic detail.